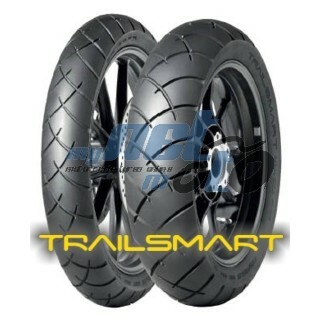 The dual-purpose, high-performance, adventure-touring Dunlop TrailSmart is for riders who like to push the limits of discovery beyond the typical boundaries of the open road. • Silica-fortified tread compound for enhanced traction and grip in wet and dry weather also helps reduce rolling resistance. 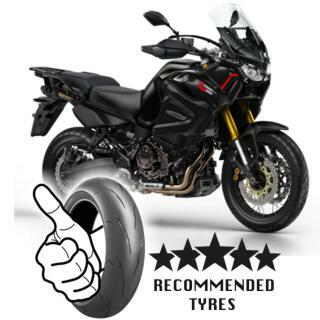 • V-shaped pattern with crossing grooves pulls water quickly and effectively away from the tread contact patch to help keep more rubber on the road in wet weather as well as enhance off-road traction. • Enhanced abrasion resistance yields higher mileage during highway usage, while the new tread-block design provides enhanced wear resistance in off-road conditions. • Dunlop’s Jointless Band (JLB) rear-tire construction utilizes a continuously wound belt that enables smooth performance at highway speeds, a more consistent contact patch and enhanced shock absorption.